Russian physician; born in Yekaterinoslav about 1851. His early education was confined to the study of the Old Testament and of the Talmud and its commentaries. His parents were poor, and as a boy he was required to help his father at butter-making. The influence of his elder brother Ilya, then a university student, led him to books and to miscellaneous reading. At the age of fifteen, and again at sixteen, he unsuccessfully essayed to enter the classical gymnasium of his native town. 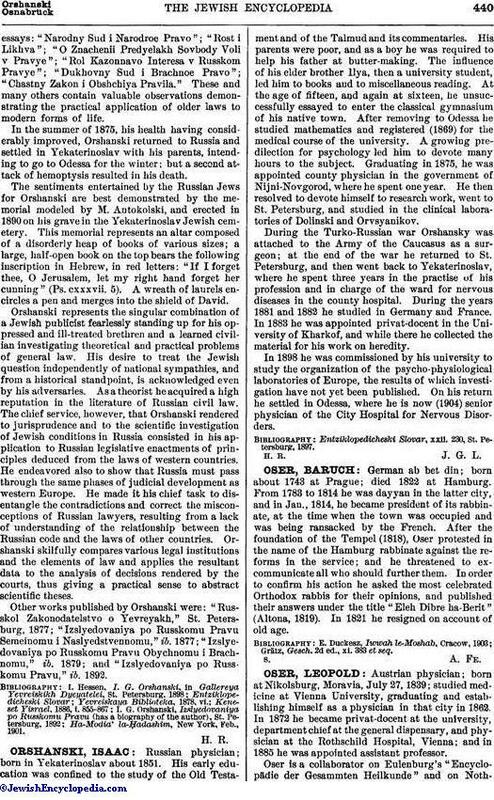 After removing to Odessa he studied mathematics and registered (1869) for the medical course of the university. A growing predilection for psychology led him to devote many hours to the subject. Graduating in 1875, he was appointed county physician in the government of Nijni-Novgorod, where he spent one year. He then resolved to devote himself to research work, went to St. Petersburg, and studied in the clinical laboratories of Dolinski and Orvsyanikov. During the Turko-Russian war Orshansky was attached to the Army of the Caucasus as a surgeon; at the end of the war he returned to St. Petersburg, and then went back to Yekaterinoslav, where he spent three years in the practise of his profession and in charge of the ward for nervous diseases in the county hospital. During the years 1881 and 1882 he studied in Germany and France. In 1883 he was appointed privat-docent in the University of Kharkof, and while there he collected the material for his work on heredity. In 1898 he was commissioned by his university to study the organization of the psycho-physiological laboratories of Europe, the results of which investigation have not yet been published. On his return he settled in Odessa, where he is now (1904) senior physician of the City Hospital for Nervous Disorders. Entziklopedicheski Slovar, xxii. 230, St. Petersburg, 1897.